Monty: “I’m as confident of Rory winning at Valhalla as I was in one of Tiger’s victories in 2000"
Colin Montgomerie reckons there’s only one winner of this week’s US PGA and tipped Rory McIlroy to run away with his fourth major title at Valhalla. Not only that, the great Scot sees the new-look McIlroy going on to dominate the game the way Tiger Woods did in 2000 and potentially winning four or five majors in a row. Massively impressed with the way McIlroy captured major No 3 at The Open in Hoylake, the big Scot is convinced that Rickie Fowler, Sergio Garcia and the rest have no chance if Rory plays his A game in Louisville. Assessing the chances of Fowler, Monty said: “I think he has really performed superbly well in the majors, fifth in the Masters, second in the US Open, second in The Open, there’s no one performed — if you look at consistency — any better than Ricky Fowler. “At the same time I have to say if Rory plays his best at Valhalla, there’s one winner and it’s the same guy that won The Open. With three major wins in four years, McIlroy is on track to become the greatest of all time and leave Tiger Woods and Jack Nicklaus in the dust. Can he do it? Monty is unsure. But he reckons that if the 25-year old Holywood star dominates for the next few years and gets to 10 major wins, then anything is possible. Sine he broke off his engagement with Caroline Wozniacki in May, McIlroy has been transformed, winning the BMW PGA at Wentworth before going on to a dominating Open win at Royal Liverpool. Convinced we saw a more mature and relaxed Rory at Hoylake, Monty said: “I think he was much more relaxed on the course and he was swinging the putter with a lot more freedom at the Open. “I know the greens are slightly slow and you have to hit them slightly harder but at the same time there was a lot more freedom in his golf and he needed that. “There were almost constraints on him and it was a shame and now that’s gone and he has another major under his belt. On the transformation in his life off the course, Montgomerie added: “It certainly hasn’t hindered any of the decisions that he made, some very, very tough life decisions that he had to make earlier in the year, in April there, in May. Montgomerie will tee it up at Valhalla as the US Senior PGA champion but while he’s won two senior majors this year, he sees McIlroy capable of winning as many as three or four in a row, just as Tiger Woods did in 2000. On the possibility of a Rory Slam, he looked again to Valhalla and said: “I think if you had money you’d put it on to win, I wouldn’t worry about the each-way bet. “I’m as confident of Rory winning at Valhalla as I was in one of Tiger’s victories in 2000 when he won four major in a row. With the next few majors coming at Augusta National, Chambers Bay and St Andrews, McIlroy could complete the career grand Slam in the Masters and make it four major wins in row the US Open and five in a row at the Home of Golf. “Well he’s that good,” Montgomerie said. “We are very, very fortunate that we have someone in Britain that’s performing the way that he is and it’s great for Irish golf. “That’s the eighth major that the Irish have won, it’s amazing really what Ireland has done over the last years and he is continuing that but he will take it forward, he will take it on and I think everyone would agree. Padraig Harrington believes McIlroy’s real rivals will emerge from the US college ranks over the next few years. But as for the current crop, Montgomerie is not sure than Fowler will be the Mickelson to McIlroy’s Woods having seen Sergio Garcia fail to step up to the plate. He said: “We said that didn’t we in ’99 when Garcia first came on the scene against Tiger at Medinah didn’t we and it didn’t quite materialise. “You have got to be careful about these things but at the same time it’s an exciting time. The youngsters are both 25 years old and are coming through and it’s super to see. ***'The U.S. PGA Championship and The 2014 Ryder Cup will both be live on Sky Sports. Until Tiger Woods is wheeled away on a hospital gurney, never to be seen again, or possibly when he's won 15 majors, Rory McIlroy need not worry about beng forced to bear the burden of being the golf's poster boy. Jack Nicklaus has been a huge fan of Rory McIlroy’s for quite some time but even the Golden Bear was bowled over by the Holywood star’s dramatic back nine comeback to win his fourth major at Valhalla on Sunday. McIlroy contemplates Rory Slam: "To win three majors in a row and maybe hold all four if I win the US Open, it is huge things we are talking about here"
Rory McIlroy wants to win the Masters and his third major in a row to complete the career grand slam at Augusta next April. But he also hinted, just for a moment, that thoughts of holding all four majors at the same time are flitting through his head. Tiger Woods and Rory McIlroy will face off in The Barclays next week. 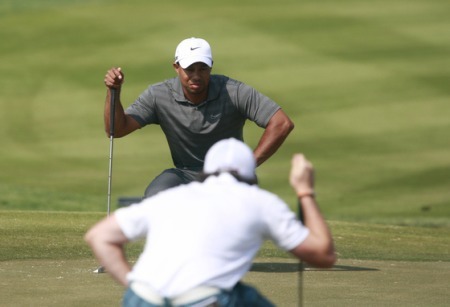 Pictured here in Abu Dhabi on 28 January by Eoin Clarke/www.golffile.ieWorld No 1 and newly crowned US PGA champion Rory McIlroy accepts that comparisons with Tiger Woods are inevitable now that he’s won his second major. McIlroy plays down "Rory era"
Rory McIlroy reflects on the significance of his US PGA win and golf’s new era for CBS today.It might be the end of an aura but while world No 1 Rory McIlroy is now “the man” he does not believe that Tiger Woods will simply fade away.